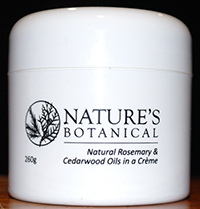 A soft white creamy appearance and feel, Nature’s Botanical Crème has the texture of a high end moisturiser and a pleasant aromatic odour reminiscent of its essential oil base. When the Crème is rubbed into the skin it becomes transparent and leaves no oily residue. It certainly is a unique product and is Nature’s Botanical best seller with customers throughout the years being extremely pleased with the results.